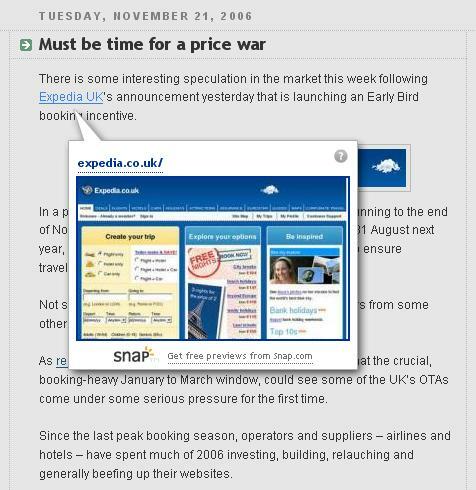 Travolution Blog: Handy tool or irritating pop-up? Handy tool or irritating pop-up? UPDATE: Removed the Snap.com tool on 2 December 2006 - overwhelmingly negative responses. Some of you may have noticed that we've been playing around with a new tool on the blog in the past few days. Pass your mouse over any link on the blog and you will be greeted with a small screen shot of the website relating to the particular URL. The only time it becomes annoying is when you click on the comments link to add a comment, other than that it looks good. Not a fan personally Kevin, find it quite obtrusive and the thumbnail is no real use for me. Good idea in theory, really annoying IRL. It's dreadful. When I cilcked on a link I saw this little box flash up but then it disappeared and I couldn't find it. I thought it was a popunder at first. It took me a while to figure out what was going on. The only circumstance I can think when it would be useful is if the user wants to know what the destination page looks like in order to decide whether to click the link or not. I just don't see that it's useful here, so it's just an annoying distraction that will ultimately make people less likely to use the site.